Navigating the job search, acing interviews, and creating resumes can be challenging. We know there’s a lot to learn about these processes, and we want to help you by answering your questions. Our very own industry experts at Express Employment Professionals are posting their recruitment and hiring answers right here on the Movin’ On Up blog. 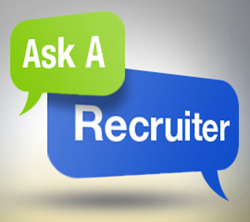 In the third installment of our series, “Ask a Recruiter,” we’re excited to feature a question from Movin’ On Up reader Sam. This is a great question! Unfortunately, there isn’t one single strategy that will work for all instances. Some recruiters might find your follow-up instincts pushy, while others may be thankful that you’re staying in contact. That being said, setting appropriate expectations during the initial conversation is the key! One good practice for establishing these expectations is to discuss the next steps with the interviewer before leaving the interview. By doing this, your call or email won’t come as a surprise. Instead, it will be clear that you’re simply following up as the two of you discussed. Ask the interviewer what their preferred method of communication might be, and what their timeline for filling this position looks like. You should also relay to them what your expectations for feedback might be, and discuss your communication plan should the process exceed that timeline. If your expectations aren’t the same as the interviewer’s, this is the place where they can help re-align what will happen next, and when. Get their permission to follow up at a certain date and time, and then reference that permission when you speak to them again, or on any voicemail or email you send. Another issue that can arise when proper expectations haven’t been set is that one party ends up doing all of the communicating. This is where that “pushy” feeling comes into play. Have you ever found yourself doing this? You call, leave a message, call back again, leave another message, send a couple of emails, and still don’t hear anything back from the recruiter. How frustrating! I’m a firm believer that the squeaky wheel gets the oil, but it’s also very easy to overdue your follow up. If you leave a voice or email message, give that recruiter time to follow up with you. If you try to reach out to them again, say within 24 hours, try not to leave a second voicemail. Recruiters often have many job orders they are working on at one time in addition to a very wide assortment of other tasks they must accomplish each day. If you’ve set expectations correctly, and followed up as you said you would, you’ll hear from them as soon as they’ve got news to communicate! Thanks for asking, Sam! And thank you to Joe Paquette from Express for providing the answer!